The best lawns and gardens are marked by their commitment to landscape maintenance. 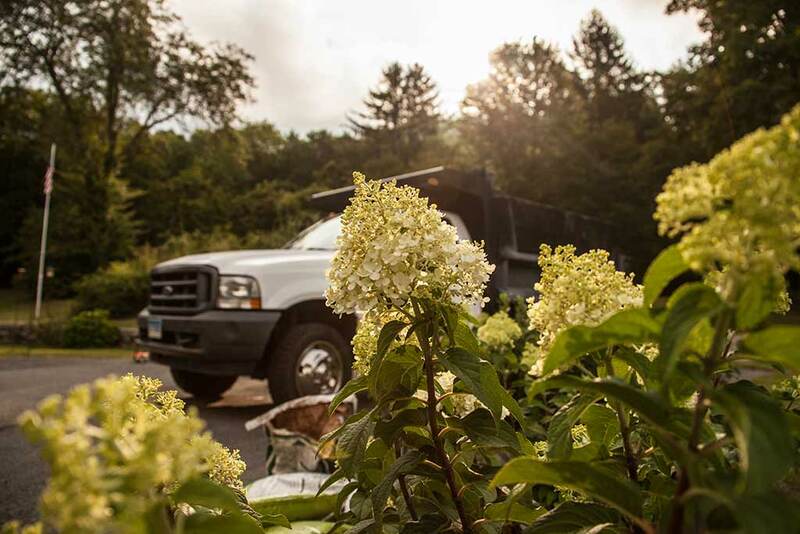 Especially in Southeastern Connecticut, each new season requires planning so the next can be just as vibrant. Visit our services calendar for a complete list of monthly services. Cleanup and encourage new growth. Prune back perennials and trees to boost new growth. Use the moderate temperatures in Connecticut to prepare next year’s lawn. Your lawn thrives in the cool weather of fall. Avoid a patchy lawn by promptly vacuuming fall leaves. Then take this opportunity to aerate and overseed your lawn by slice seeding. Your final lawn mowing is more important than you may realize. The mowing height of the final cut should be slightly lower than normal to reduce the amount of nutrients required from the roots throughout the winter. A great lawn comes from great soil. With every lawn mowing, your lawn mower is compacting the soil. Aerating your lawn removes small plugs of soil; allowing moisture, oxygen, and nutrients to easily reach your lawn’s root system. Aerating in the Spring and Fall strengthens your lawn’s roots, choking out weeds. The aerating process presents a perfect opportunity to overseed your lawn. The process of slice seeding splits each seed allowing the germination process to occur more quickly and effectively. Slice seeding after aerating allows the seed to penetrate the surface for a more successful germination. The perfect time to aerate is in the Spring and Fall, when the ground temperature is close to 55 degrees and there is more moisture in the soil. Enjoy the summer months without the hassle of mowing. Get on our crew’s weekly schedule to maintain your lawn’s health. Our crew is conscientious of blade height and alternating patterns to optimize lawn growth. We have the capability to bag grass clippings upon request. Lawn maintenance programs incorporate weekly mowing and trimming, fertilizing, garden pruning and dead-heading, weeding, and all other forms of plant maintenance. Let us customize a program to suit your needs. Remove any sign that winter happened. Freshen up your garden beds with compost and mulch. Plant summer blooming bulbs and get instant color for the whole season with a variety of annuals. Cut down dense underbrush before new growth. Fertilize trees and shrubs. The winter takes its toll on hardscapes as well. Our masonry crew can make necessary adjustments and repairs from heaving and cracking on stone patios, walls, and pathways. Snowplowing often leaves your stone driveway in distress after a long winter. We can re-grade, re-pitch, and spread new stone to make your driveway like new. We have the equipment to solve erosion and drainage issues. Check out our Garden Store for available stone products. If we don’t have it in stock, we can order it. A fresh coating of pea stone can provide an appealing contrast to your green lawn and colorful flower beds. We can prune or remove trees and shrubs to open up for sunlight and airflow. Benefit from our maintenance program by receiving timely pruning for a well-kept look. Selective pruning can save a dying tree or bush and encourage new growth. Consider the implications of dying trees during hurricane season. Call us to prevent damage to your home and family.